The resurrection of a design. 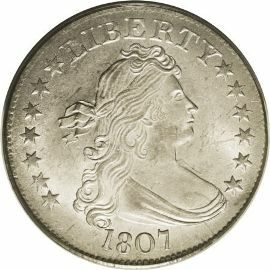 The Draped Bust Quarter with Heraldic Eagle was the second in a long line of varieties for this denomination. They were minted from 1804 to 1807 and designed by Robert Scot. 15 stars. The obverse also has the inscription LIBERTY above and the date below. 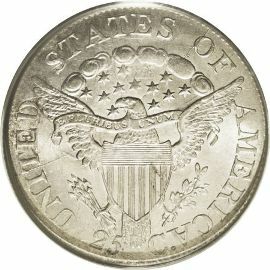 The reverse of these silver coins changed from the small eagle version to the heraldic eagle version in 1804. The new coins reverse was designed around the great seal of the United States. It also has 13 stars between the eagle’s wings and beneath the clouds. It also shows an olive branch and a sheaf of arrows clutched in each of the eagle’s talons. It also has an inscription around the entire design that reads THE UNITED STATES OF AMERICA.